Gable Home now resides permanently in a location just south of the campus, where University of Illinois at Urbana-Champaign solar decathletes and faculty joined the Green Riders on the house's front porch. Public tours: To schedule a tour, contact the iHotel at 217-819-5000. Gable Home, the University of Illinois at Urbana-Champaign's U.S. Department of Energy Solar Decathlon 2009 entry, now resides just south of campus by the iHotel and Conference Center. The house remains property of the university but is shared with iHotel as part of a public-private partnership. 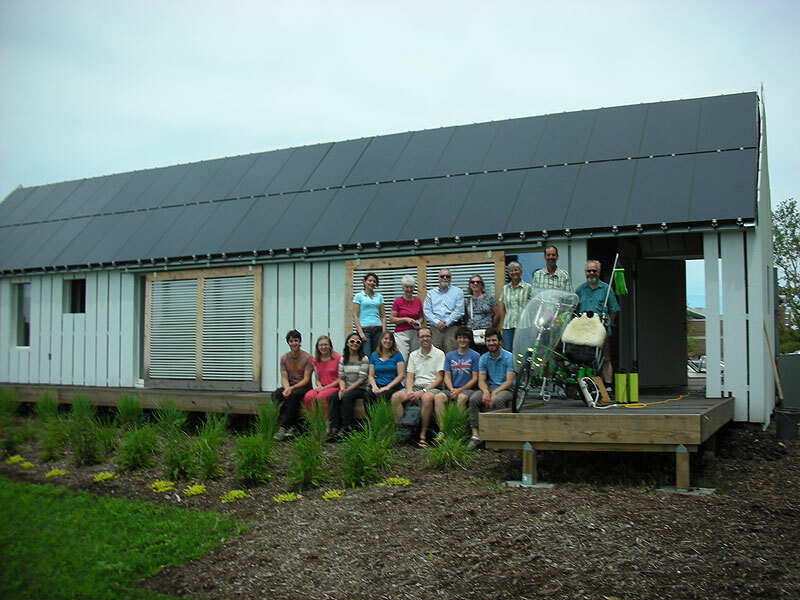 Relying on traditional techniques in homebuilding, the creative reuse of materials, and new advances in technology, the Illinois decathletes created a house that performed exceptionally well in Solar Decathlon 2009. Gable Home's second-place overall finish was evidence not only of its capacity to produce up to four times more energy than it needs but also its ability to thrive in a lively, eventful setting. Since the competition, University of Illinois at Urbana-Champaign faculty, staff, and students have been collecting data on Gable Home's indoor air temperature, relative humidity, dew point, and vapor pressure. Meanwhile, hundreds of people have visited. "The number of people requesting to see the house has been unbelievable," says Kate Brown, housing research specialist at the university's School of Architecture. Several special guests have visited Gable Home since its return to Champaign. Governor Pat Quinn toured the house April 20, 2010, to recognize the progress made by students before the university's 41st annual Earth Day celebration. "I've seen the future, and Gable House is the way," he said. On June 9, 2010, a group of electric bicyclers called the Green Riders came to charge its bikes as it traveled from California to Washington, D.C. The stop marked the third time it was able to recharge with renewable energy. Visit the Illinois Solar Decathlon website to follow their progress competing in the Race to Zero 2017 and Solar Decathlon China 2018.